gasfill needs companies to install trial units in Europe. Please contact us if interested. If you produce biomethane we provide a way of using it as a road fuel; again contact us if interested. There’s nothing new about running your car on other fuels apart from petrol, in fact there are millions of vehicles in the world today that don’t use petrol or diesel. Fuelling you vehicle at home or work using the same gas that heats your home, office or factory isn’t new either. This type of fuel is called Compressed Natural Gas or CNG for short. 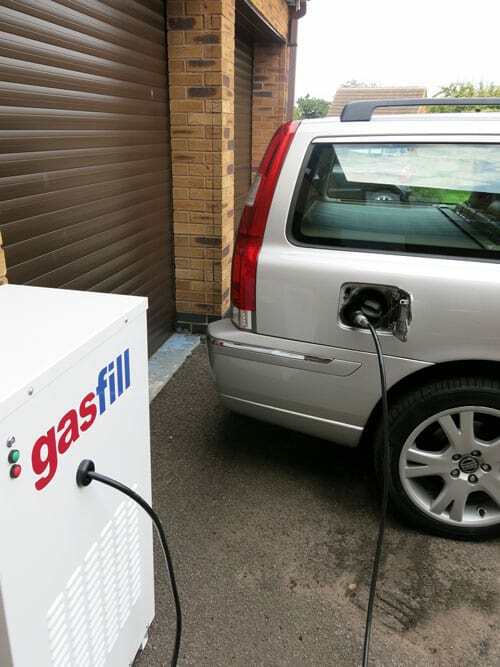 At gasfill we have developed a small slow fill CNG compressor unit that can operate at any home, office or factory around the world and is ideal for car or light van users. Our products are high quality, safe and have been extensively tried and tested. gasfill is based in the UK at Leicester. We have spent our working lives in energy, engineering and vehicle manufacturing. Our products are well designed, easy to use, proven and convenient. Based on feedback from customers our gasfill 2000 unit has now been superseded by our new, smaller gasfill HOME unit (above). This can still refuel a car or van in under 10 hours at a rate of 2.0 m3 of compressed natural gas per hour but is smaller and easier to install. That’s enough to give you a range of over 195 miles on a full fill. Units are available now so contact us for further details.